During its fourth quarter earnings call, Apple made a surprise announcement, dealing a major blow to analysts and data enthusiasts such as ourselves: going forward, the company will not be sharing unit sales figures for its products. For the past few years, analysts and investors have tended to focus their attention on one number, iPhone sales, and Apple apparently no longer wants its entire business to be reduced to that one indicator. When smartphone sales (naturally) started to slow down due to market saturation and slower technological progress, Apple decided to delve even further into the premium segment, bringing its average iPhone selling price to unprecedented heights and re-accelerating growth in its iPhone business. 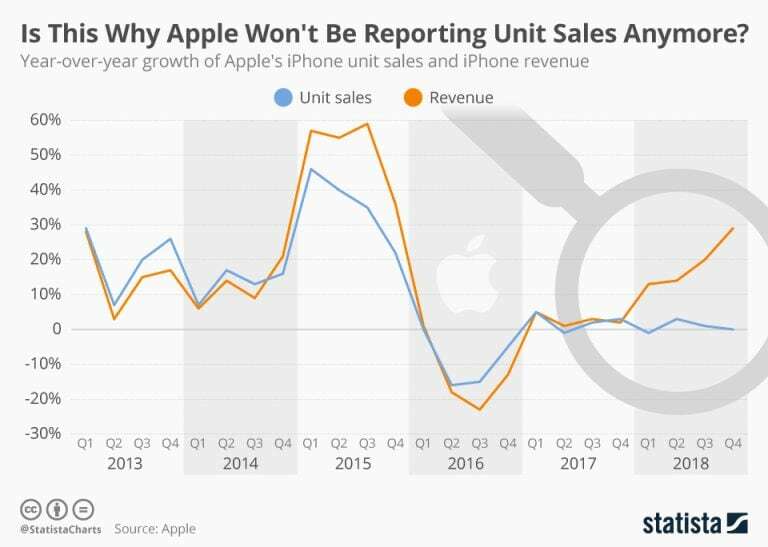 There is a disconnect though: while revenue growth has sped up with the release of the iPhone X, unit sales growth has remained flat. As the following chart shows, iPhone unit sales and revenue growth have been pretty well-aligned over the years. That is no longer the case and Apple wants us to focus on the number that is more likely to be positive going forward.